Energy-Efficient Lightbulbs May Have Dark Side When It Comes To Health : Shots - Health News Scientists have learned that compact fluorescent light bulbs could give off ultraviolet radiation if their inner coating cracks. Light-emitting diodes, another eco-friendly lighting option, won't give you a sunburn, but they do have the potential for other mild health effects. Scientists say energy-saving compact fluorescent (left) or light-emitting diode (right) light bulbs can have unsavory health effects. Everybody knows that one good way to prevent a sunburn is to stay inside, where you're safe from the sun's ultraviolet rays. Right? Well, that may not be true anymore if your house is lit with compact fluorescent light bulbs. Last month, researchers from the State University of New York at Stony Brook showed in a paper that tiny defects in the bulbs can let through UV light that can damage skin cells and lead to cancer. The researchers' data, published in the journal Photochemistry and Photobiology, is preliminary, and based on experiments in a lab. In other words, there aren't any known cases of sunburn from light bulbs yet. The researchers say it's also not that hard to avoid the dangerous rays; they recommend putting the light behind glass or keeping a few feet away from the bulb. 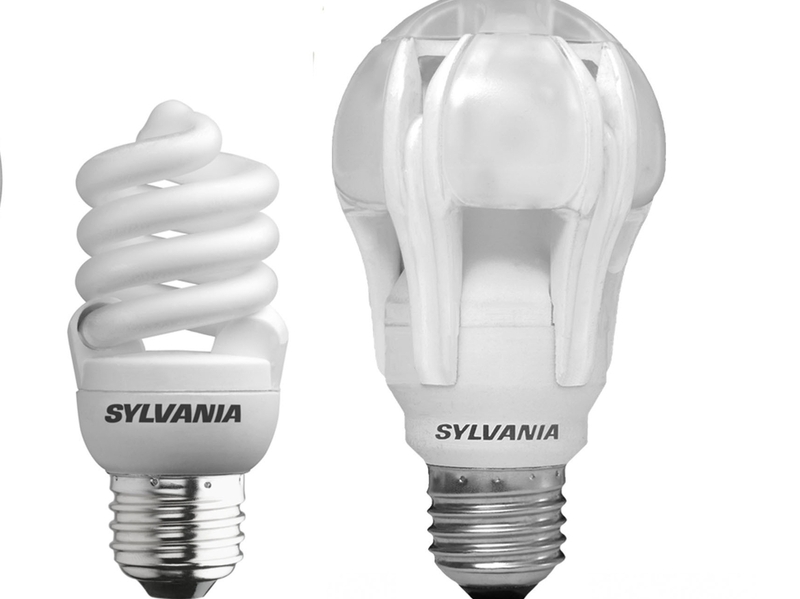 But this still isn't great news for compact fluorescent bulbs, which have gained popularity in recent years as federal efficiency standards began phasing out the widespread use of UV-free incandescent bulbs. And naturally, we at Shots wondered if the other big player in the future of lighting — light-emitting diodes, or LEDs — have any health risks of their own. First we had to understand why a household light bulb would produce UV light in the first place. As it turns out, all fluorescent light bulbs contain mercury vapor, which emits a lot of UV rays when hit with an electric current. Normally that UV is absorbed by a layer of molecules, called phosphors, on the inside of the bulb and reappears as safe white light. But if that phosphor coating cracks, UV light escapes. And according to the researchers at Stony Brook, defects are common. They saw bald spots in nearly all the bulbs they collected from retail stores. They blame the manufacturing process, when the bulbs are twisted into their signature spiral shape. "That's when you get into trouble, because [phosphor] is brittle, and it can't take the curve," says materials science professor Miriam Rafailovich, who led the research. LEDs also typically need phosphors to make white light, but fortunately for the fair-skinned, the similarity ends there. Inside most white LED bulbs is a blue light source, which is converted to a full spectrum of colors by phosphors. Even if the phosphor coating is damaged, the blue light within sits firmly on the visible spectrum, and poses no danger to human skin. "There is no UV component to LEDs, as far as I know," says Terry McGowan, director of engineering and technology for the American Lighting Association. On the other hand, all that blue light can trick your body into thinking that it's daytime. That can be a good thing if you work in a windowless office, or suffer from Seasonal Affective Disorder. But spend too much time under blue light, especially at night, and you may throw off your sleep cycle. "Human beings need bright days and dark nights," McGowan says. So while LED bulbs are a good choice for the workplace, they're a poor choice for the bedside. But at least you won't have to worry about sunscreen.